Preppy. Cool. Effortless. These are the words that come to mind when one hears the name, Tommy Hilfiger. With its signature navy blue, red, and white shades, Tommy Hilfiger’s branding as fashion fit for the “all-American girl” hits the nail right on the head. 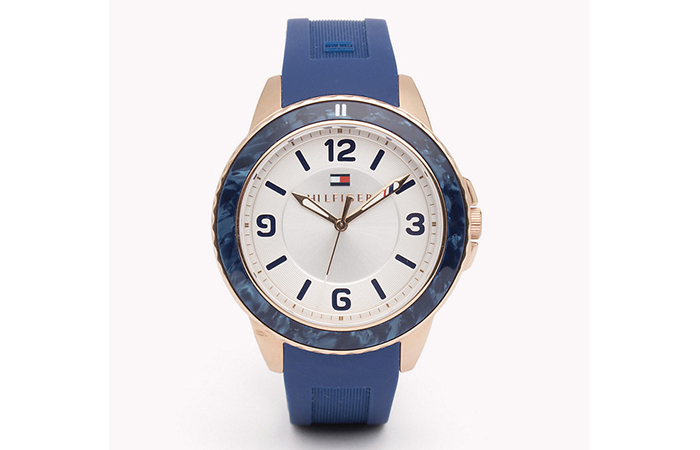 And with its nautical themed designs that continue to hold the fashion world’s attention year after year, it’s not surprising to know that women all over the world are in love with anything “Tommy.” Well, if your closet is filled to the hilt and you can’t possibly justify buying another dress, why don’t you treat yourself with a classy Tommy Hilfiger watch to brighten up your day? 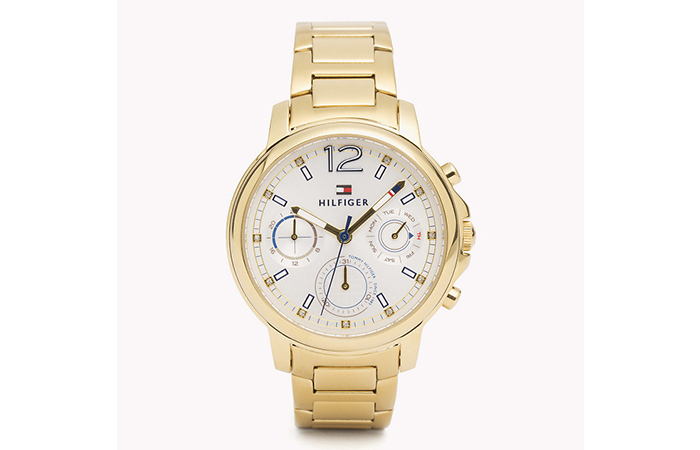 Here’s our guide to all the Tommy watches trending right now to help you make your decision! 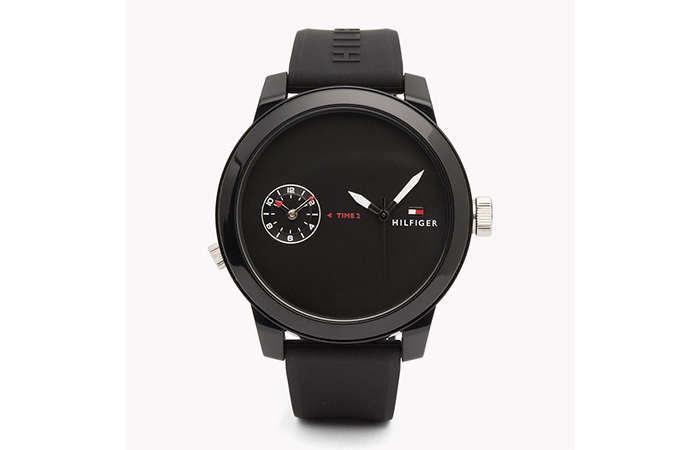 With its minimalist design and no-nonsense color, this Tommy Hilfiger watch in jet black is every neutral tones-loving girl’s dream. While the simple black silicone strap is comfortable to wear and easy to maintain, its dual dial function that allows you to follow two different time zones is perfect for your jet-setting lifestyle (or if you have loved ones living in another country). 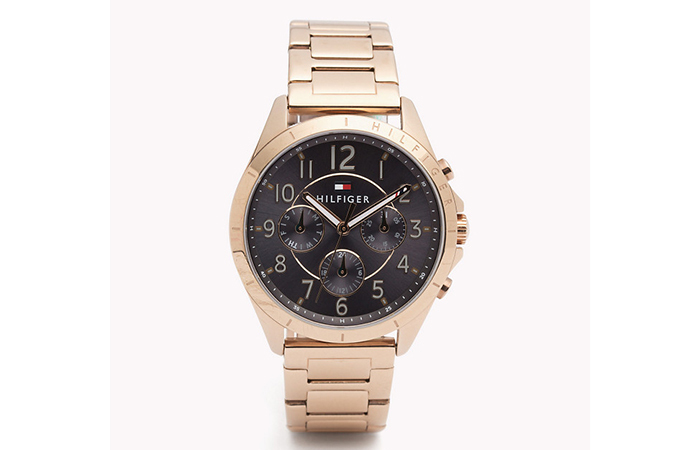 If you’re a self-proclaimed dreamer who always has head in the clouds, then this Tommy Hilfiger rose gold ladies watch will suit your style perfectly. 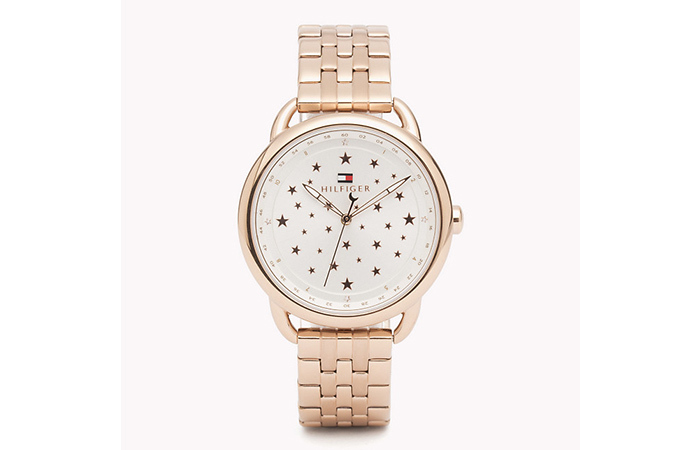 With those stunning stars scattered across the cream dial and the gorgeous rose gold finish given to the metal strap, Tommy Hilfiger has made a beautiful piece of art out of this watch. And how cute is that little moon ticking along at the end of the seconds hand! 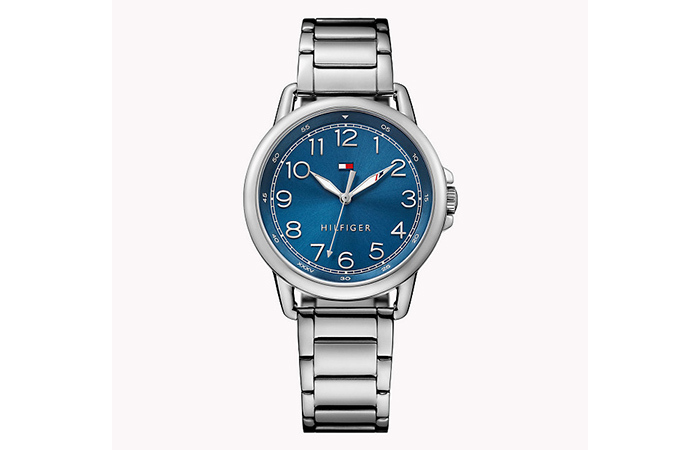 With three separate dials to keep track of the date, days and hours, this Tommy Hilfiger timepiece is designed for a multitasker. The gold-plated body, and the gorgeous metallic strap make this watch perfect for every professional woman out there who wants to make her mark in the world. The real beauty of this piece lies in its details like the subtle incorporation of the signature Tommy colors—red, white, and blue—in the hands and the big 12-hour marker looming at the top. If yours is a sea-loving heart and you’ve always dreamed of sailing away to far off places, this canvas strapped watch in the very nautical shades of navy blue and cream suits you. The silver dial has been done up in a minimalist design with simple rose gold lines acting as hour markers to stay in line with the nautical theme. Ahhh now this is a classy watch for a lady with delicate hands. This stainless steel watch is quite the study in contrasts, when it comes to form and structure, owing to the round silver dial that is flanked by the thin metal bangle straps. 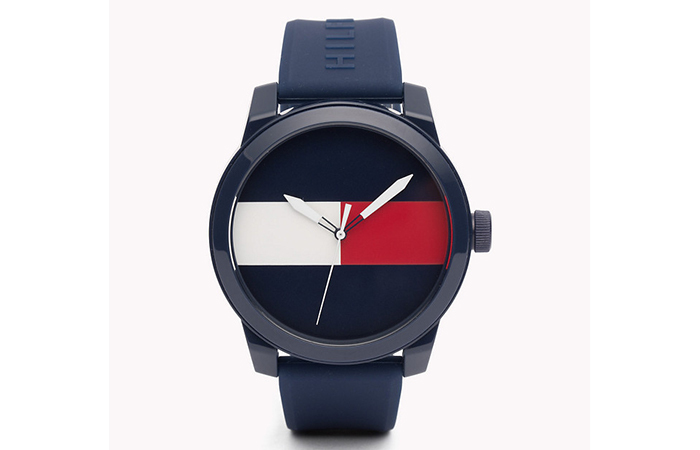 The Tommy Hilfiger logo has been subtly incorporated in the minutes hand and the 12-hour marker to add a pop of color to the otherwise minimalist design. With a dark brown strap and bold hour markers, this Tommy timepiece is perfect for someone who leans more towards androgynous styles. While the dial is a beautiful blend of cream and rose gold, pops of vibrant blue and red have been added in the hands of this watch to infuse some life into its design. 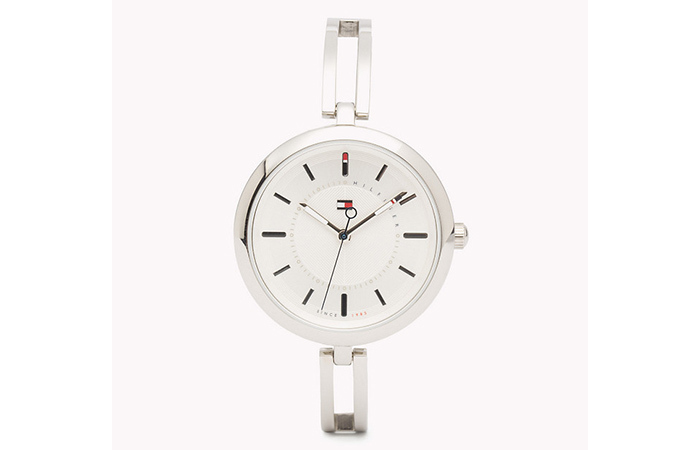 Make a bold statement with this stainless steel Tommy Hilfiger watch that is made for the powerful woman. The silver metal strap combined with the powerful blue dial and the bold faced numerical hour markers work to create a piece that is elegant, yet makes a statement. 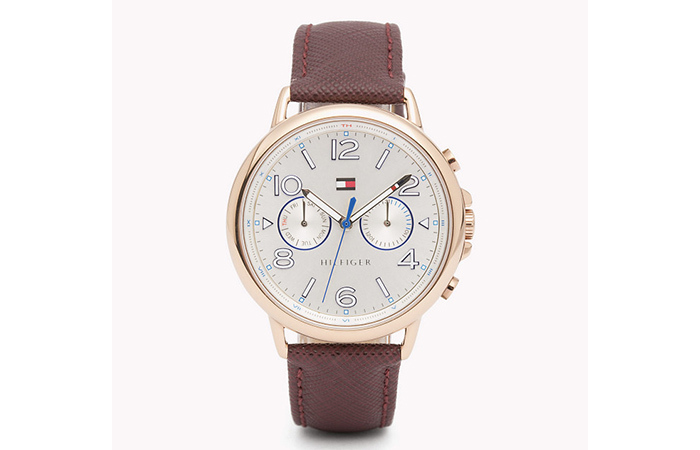 The Tommy Hilfiger charm has been added to this piece with the help of the pointed hour and minute hands in its signature colors. If you’re a huge fan of Gigi Hadid (who isn’t?) 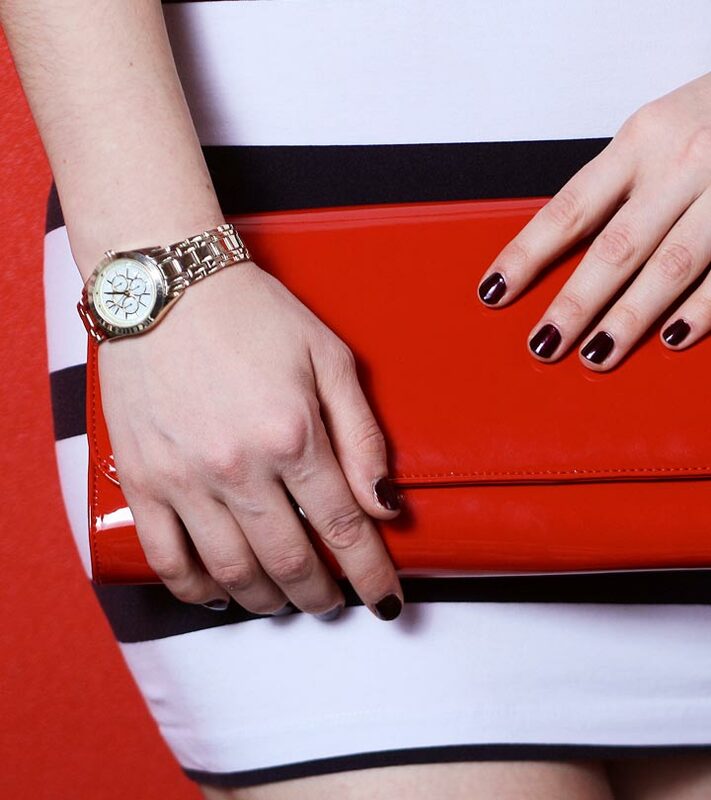 and like to take style inspiration from her, this watch she has designed as part of her collaboration with Tommy Hilfiger is something you need in your life. 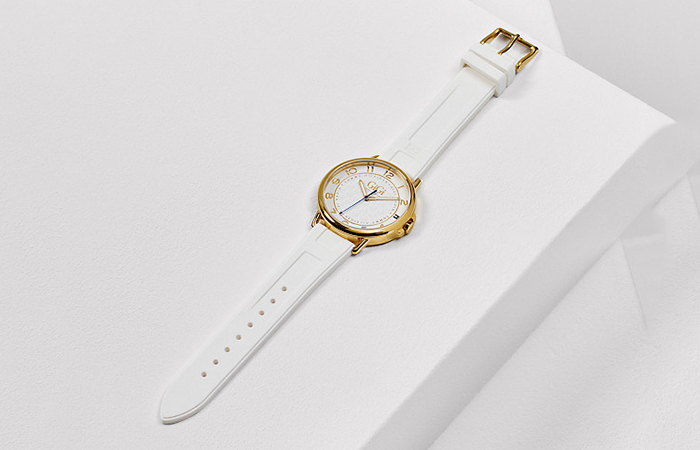 In accordance with her laid back yet elegant style, this watch has been done up with a white silicon strap and dial and accented with a gold bezel and hour markers. A beautiful contrast has been created with the blue seconds hand. When it comes to making watches that are comfortable to wear and yet look like a million bucks, Tommy Hilfiger designers do the job perfectly. This navy blue and gold watch, for example, has a strap that is made out of silicon but designed to look like a metallic strap. The cream dial has been bezel set in a navy blue ring, has gold alternating hour markers, and is equipped with a chronograph, and day and date dials. Simple and elegant. If those are the words that describe your style, here’s a watch that was made just for you. 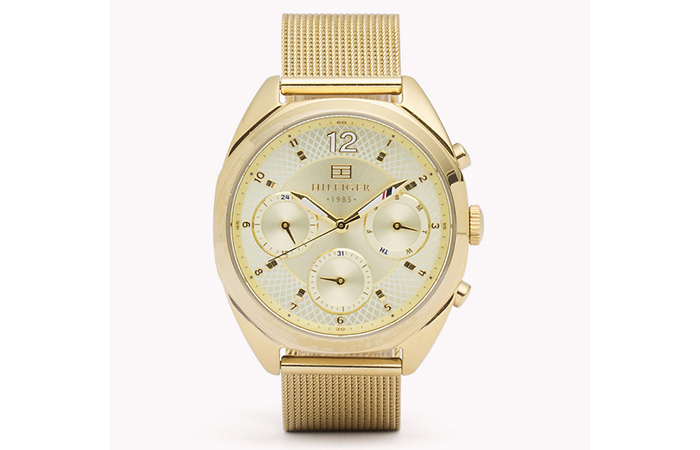 While the straps are plated with gold, the color of the dial has been kept softer with its brushed champagne shade. The only embellishment in this design is the intricately patterned cream chronograph that contrasts the simple gold linear hour markers. If you’re the kind of person who can never decide between gold and silver, here’s a watch made just for you. This two-toned metal strap watch is especially suitable for someone who likes to add masculine elements to her style. The silver dial with its chronograph and date and day dials is sure to make you feel every bit the strong, independent woman that you are. Styling your outfit can be a real pain when you can’t find the right accessories to go with it. This gold mesh strapped watch can be a real life saver in such situations. The soft champagne dial has been embossed with a matching mesh pattern to continue the tone set by the strap and to bring together the elegant design of this piece. With the recent advent of rose gold on the fashion scene in the past couple of years, it’s no surprise that Tommy Hilfiger has jumped onto this bandwagon. This marvelous timepiece wrought in rose gold plated stainless steel can be effortlessly styled for work, a casual day out, or a date night, owing to its understated black dial. Why choose between a leather strap and a metal strap when you can get the benefits of both? 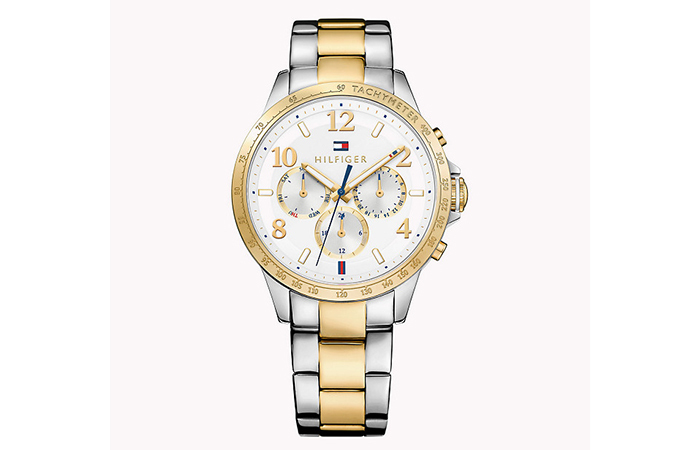 This Tommy Hilfiger watch with a silver mesh strap has the elegant look of metal but wears comfortably like a leather strap. 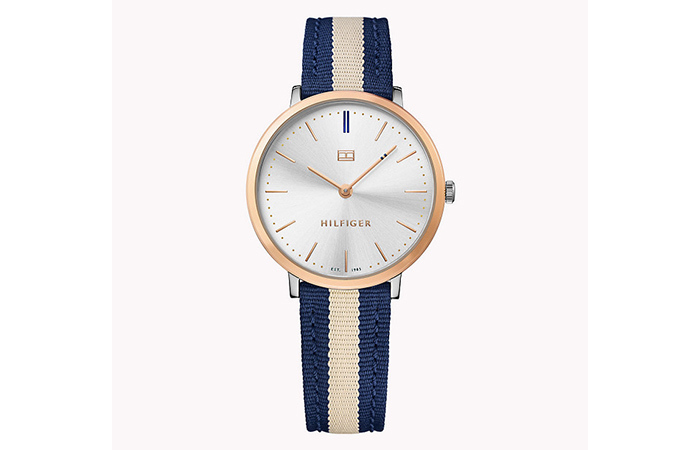 But the best part is that it comes with three interchangeable dials in a gorgeous rose gold, and elegant white, and a sporty navy blue. 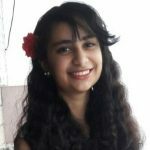 Change up your look to suit your mood and the occasion! 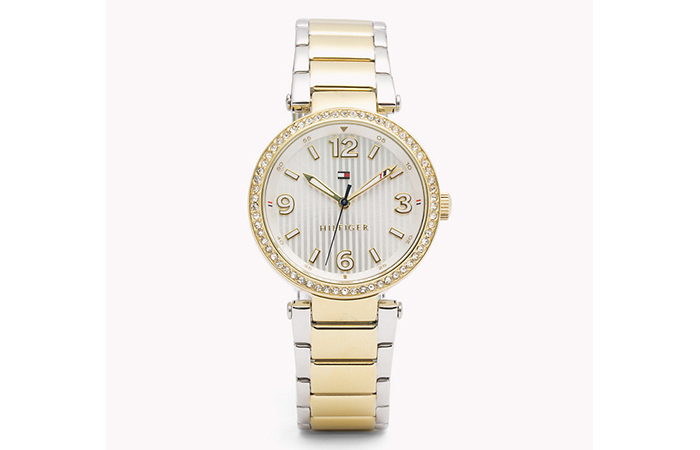 Pamper yourself with this fancy Tommy Hilfiger woman’s watch that is sure to make you the talk of the town. 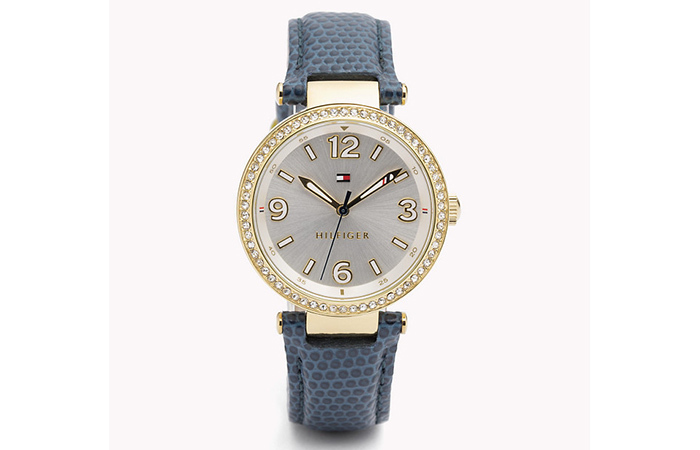 This fancy piece comes with a blue faux leather strap in a snake skin pattern that is bold, yet classy. The highlight of this watch, though, is the gray dial bezel set with white stones that glint and sparkle when hit with light. 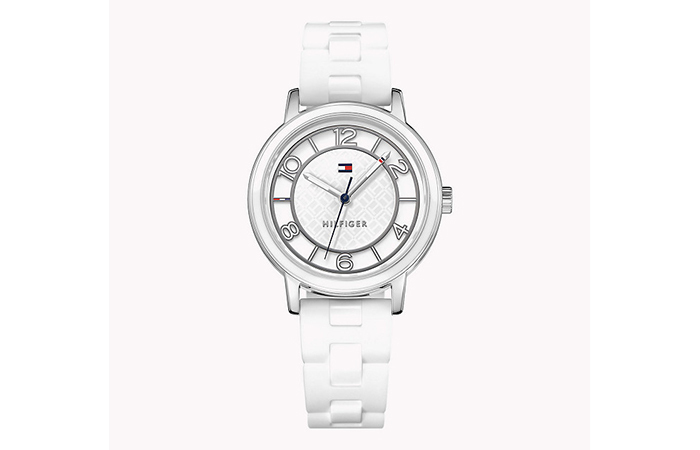 With its stark white strap and all-silver dial, ‘Snow White’ is the only phrase that comes to mind when looking at it. 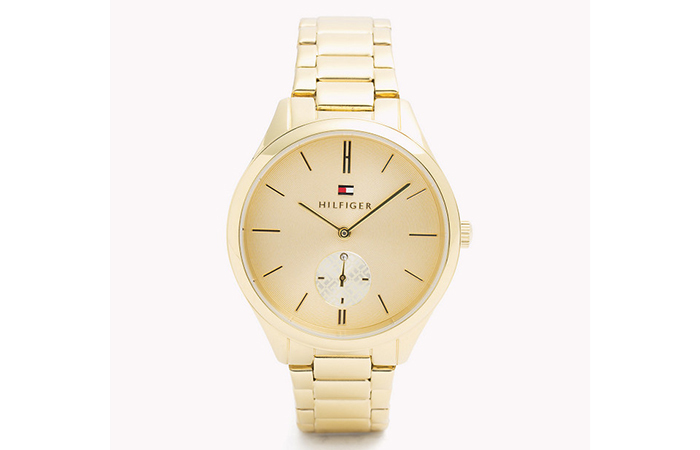 This is one of the most elegant Tommy Hilfiger ladies watches. It comes with a white dial embossed with an intricate repeating pattern of the TH monogram and is set with gorgeous white alternating numerical hour markers, to complete the graceful design. When it comes to integrating class and quirk, Tommy Hilfiger is unrivaled in the fashion world. The midnight blue marble bezel of this watch adds a hint of luxury to his timepiece, while the white dial set with numerical hour markers in a bold and unconventional font show your more relaxed side. 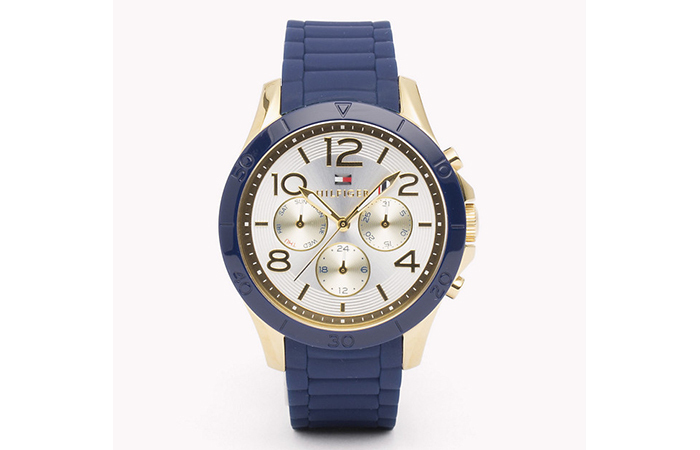 Show your love for all things Tommy with this navy blue silicon strapped watch that is guaranteed to make heads turn. 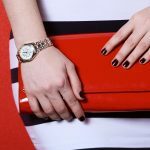 The dial of this statement timepiece is dominated with the Tommy Hilfiger red and white flag and left largely unembellished to avoid drawing attention away from it. 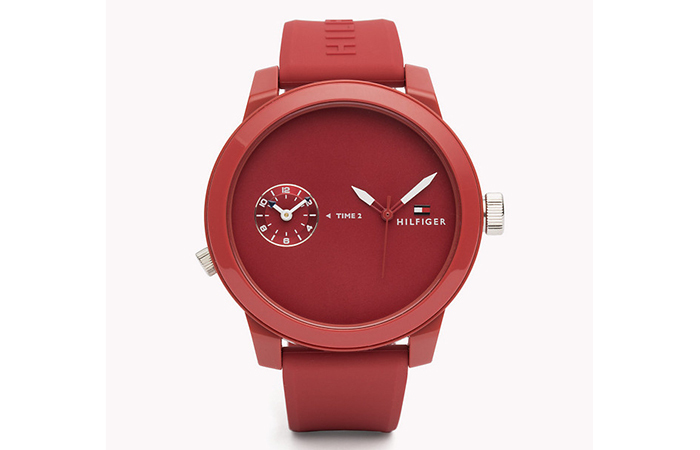 There’s no way you can be a wallflower when wearing this Tommy watch in a sizzling red shade. To keep all the focus on the statement color of this piece, the dial has been left bereft of any hour markers. However, the watch has been equipped with a secondary dial to follow another time zone. Now here’s a piece that you can wear to glitzy occasions (a dinner party or a wedding, maybe?). This piece goes all out with its gold and silver-plated metallic strap and the dial bezel set with sparkling white stones. The dial itself has been designed in a gorgeous striped pattern in cream and silver and set with numerical hour markers at each quarter. 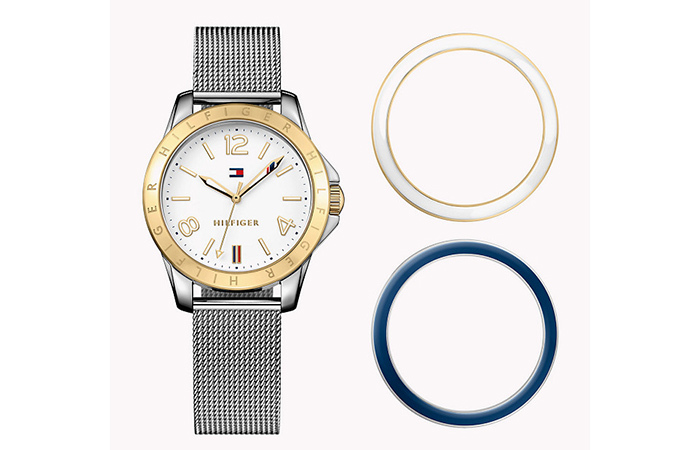 So, here ends the list of latest Tommy Hilfiger watches for women. Now that you have your choices laid out in front of you, comment below and let us know which Tommy Hilfiger watch you can’t wait to get your hands on!